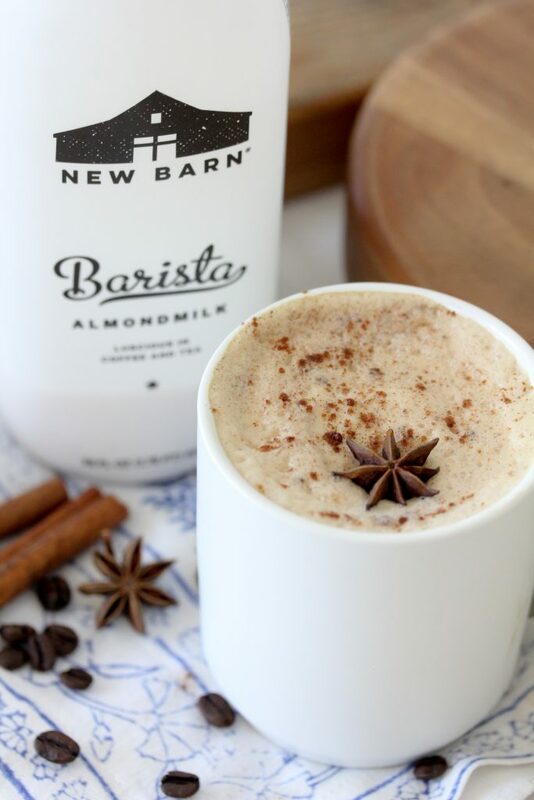 This Dairy-Free Dirty Chai Latte is brought to you by The Whole Smiths in collaboration with New Barn Organic AlmondMilk. 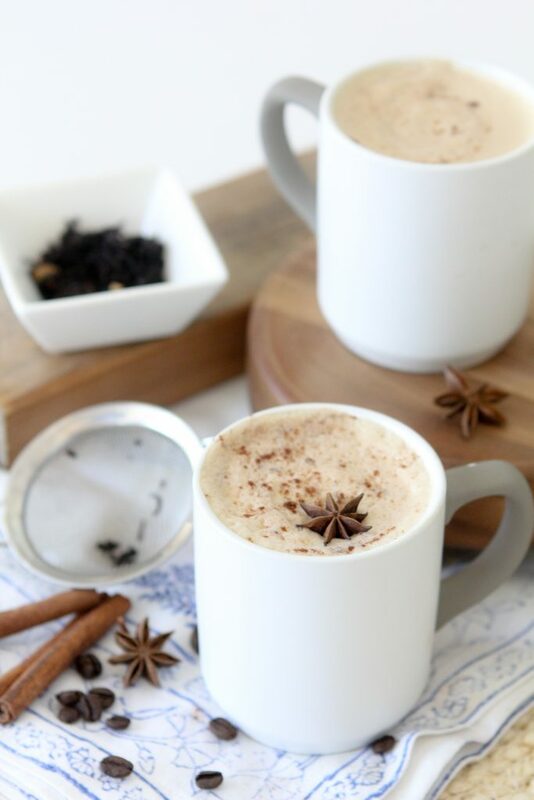 It’s the perfect dairy-free, paleo coffee drink to start your morning. Here’s the deal, I don’t drink caffeine but I love me my coffee drinks. We have two canisters of coffee in our coffee nook / bar; regular and decaf. Aka his and hers. There’s something I find so darn comforting about sitting down and enjoying a warm, creamy (because I don’t drink it black) cup of coffee. Add some chai flavors to it and I’m sold. It’s always a moment during my day to sit in enjoyment and be quiet, well, not always quiet I guess. The kids usually find something to bring to my attention while I’m trying to escape into my mug of chai goodness and it’s usually nonsense. But you know what I mean. These days I savor those quiet moments in the day when all is quiet and I’m left with my thoughts. They don’t happen as often as they used to and now I’ve learned that I need to create those moment and make room for them in my life. It’s not like back in the day when I was riddled with free time and quiet moments. 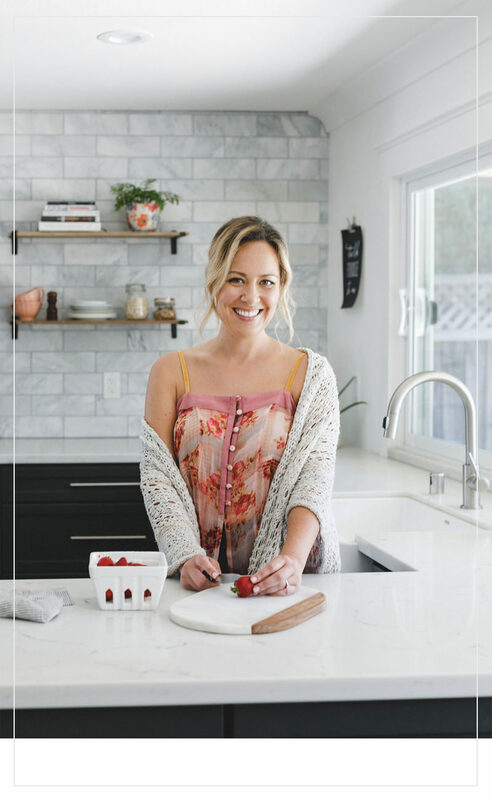 I don’t spend a lot of time talking about kids and motherhood on this blog as try to keep the focus on the food but I think us moms deserve a moment of recognition. (Truth be told we deserve more than just a moment but we’re moms, who has more than a moment, eh?) I always knew I would be a mom. I knew I wasn’t always ready for them but I always knew having children would be part of my life story. I loved caring for children from an early age, my first job ever was as an assistant at a preschool. I loved babysitting, I tutored, I worked at the daycare at the local gym, I worked with underprivileged children, etc. etc. I’ve always knew children were such amazing souls and in fact, quite hilarious. Being around children always made me happy and even after college I continued volunteering with youth organizations. In short, I’ve spent a lot of time around kids of all ages prior to having my own. So you think on some level I knew what to expect when I had children. Helllll no. I was blindsided. It’s is so much harder, stressful, worrisome and emotional than I ever could have imagined. I thought I understood children, I thought I knew how communicate with children. Kids LOVED me. They listened to me. We had fun. I helped them with their homework when they had no one else to do so. And I never thought I would need a Dirty Chai Latte to get me a moment of sanity in my day. Oh! I also thought my future kids would be angels 100% of the time and we would have this thing on lock. Yeah, no. They make me more bonkers than I even knew I had in me. I didn’t know I could be driven so mad until I had kids. But here’s the deal. I wouldn’t change a minute of it. How masochistic is that? I would wake up and live every nonsensical moment side by side with them and never change a thing over and over again. 30 years from now when they are grown with families of their own, I know I will be willing to give anything to have just one day with them as children again. But I will never be able to. So I try to remember that each and every day. These crazy moments as insane as they may make us, are truly so fleeting. I will look back at this nonsense and think of them as “the good ‘ol days”. Being a mom is simultaneously the hardest and most glorious, life experience I will ever have. So to all of you moms out there loving on your kids so hard and fighting tears in the same breath, cheers to you. It truly is the toughest robin the world. 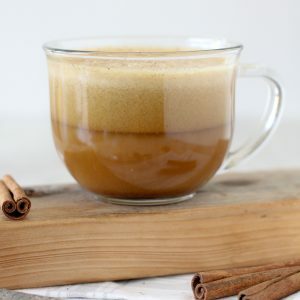 That’s why when I was thinking of a recipe I could create for Mother’s Day I immediately thought of a warm coffee drink to ease our minds and force us into a quiet moment with ourselves. All of us moms deserve some quiet time during our day to gather our thoughts and just BE. Be in the moment of us, taking care of our needs, thinking about anything else besides what everyone else in our family is needing from us. 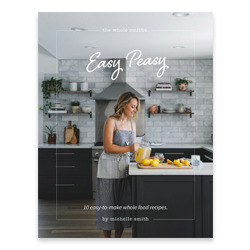 It’s also something that’s easy enough for the kids to make on their own… or make with just a little bit of help. Or if they’re still too young, it’s something that easy enough for us to whip up for ourselves, ha. And who doesn’t love chai?? As you know, my latte recipes never require anything other than a coffee pot to make. I don’t use espresso because I know not everyone has an espresso machine and I want this to be easy to everyone to make. You don’t even need a little foamer as I get mine creamy and foamy in a blender. In fact, I think it makes it even foamier and creamier in the blender. 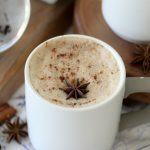 I have a couple of coffee drinks on the blog like my Whole30 Latte and my Paleo Pumpkin Spice Latte and they are some of my most popular so I am quite certain you are going to love this Dairy-Free Dirty Chai Latte just as much. 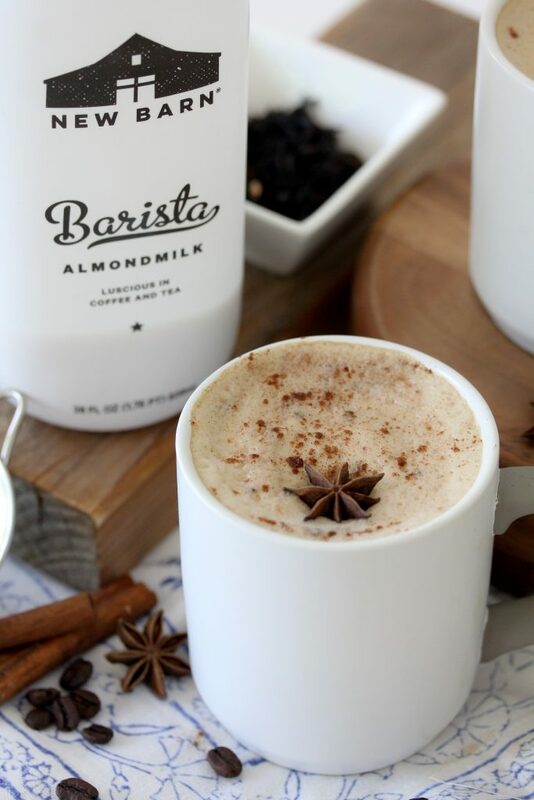 Finding the right almond milk can prove to be hard to do when wanting a creamy and foamy latte. 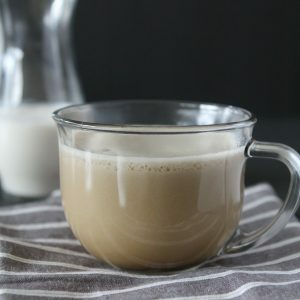 Most almond milks fall flat when blended into a coffee drink. Fortunately my friends and New Barn have cracked the code with their Barista variety of almond milk. It’s designed to give coffee drinks that luscious, rich taste and feel that traditional dairy can usually only do. Not to mention, New Barn Organic Almondmilks are, well, as the name states, organic. Not to mention they’re loaded with almonds, many more than other brands on the market. I believe that’s what gives their almond milks a more full-bodied texture and flavor. Something they aren’t loaded with however are artificial flavors and emulsifiers. Hallelujah! 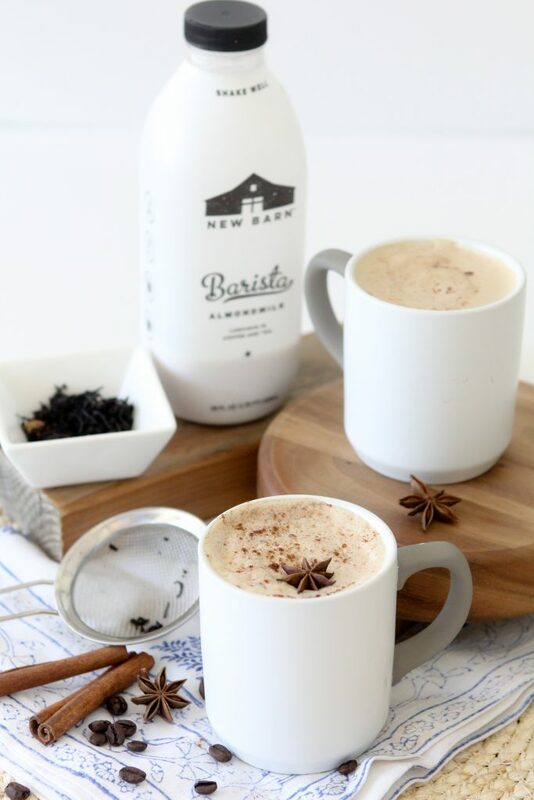 So whether it’s Mother’s Day or a Monday, you deserve this quiet moment and this Dairy-Free Dirty Chai Latte. 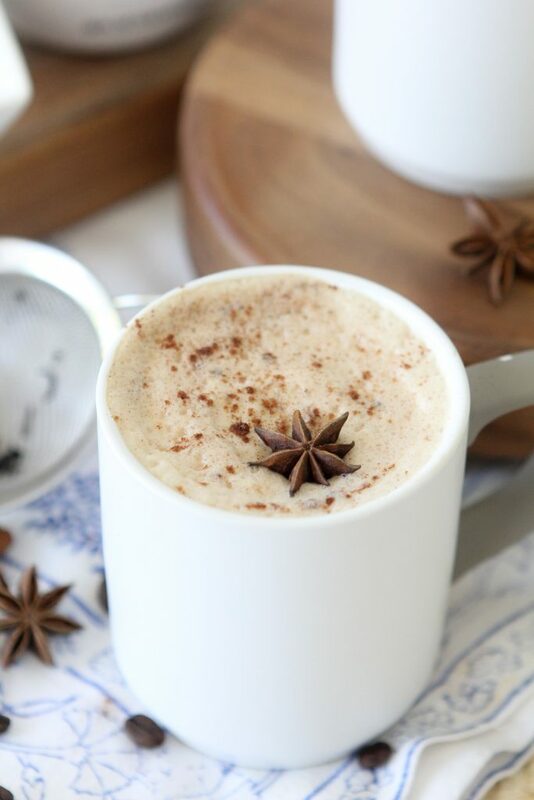 This Dairy-Free Dirty Chai Latte is the perfect way to start your morning. 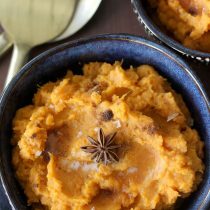 Paleo friendly and delicious! Add the almond milk to a saucepan and heat over medium heat. Add the tea to the almond milk and brew it as it heats. Warm until the milk comes to a low simmer and strain the tea. 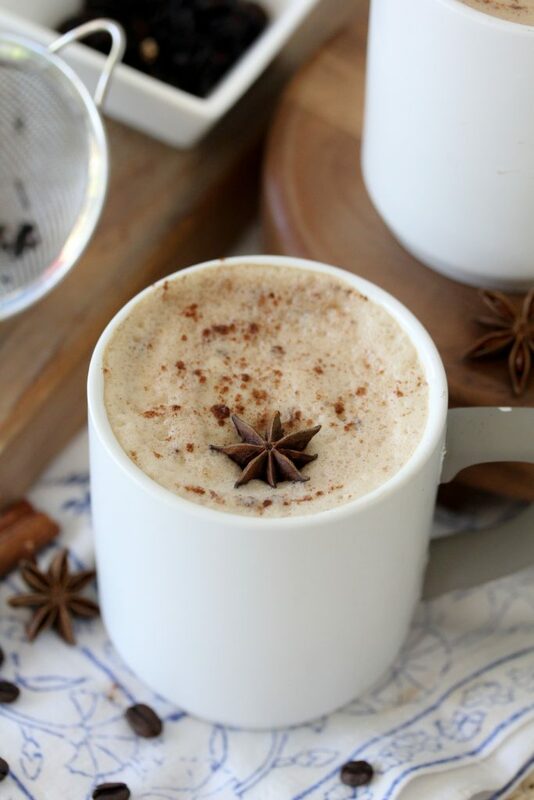 Add the chai steeped almond milk, coffee, maple syrup, vanilla, cinnamon and cardamom to a blender and blend on high for 5 seconds. The latte will be frothy and foamy. Pour into a mug and find a cozy spot to sit and sip on it. 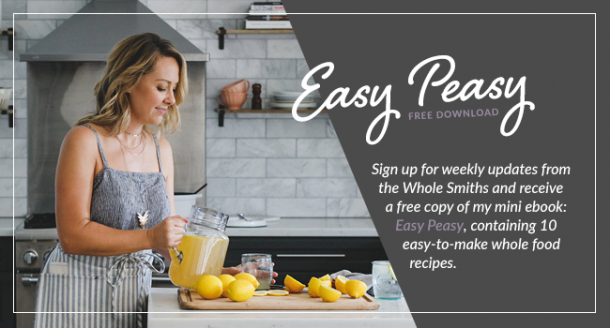 Does the prep really take 5 hours! What about this recipe takes a hour, or is this a typo? I love a good chai! However, I don’t like coffee! How would I make this without coffee? Can it be made iced also? As I return to school this week, I’d like to be able tinder my drinks at home and not stop at the coffee shops as frequently.